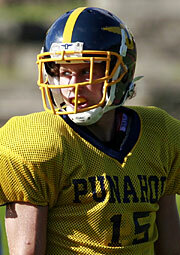 Another week of relative silence didn't hurt the Punahou Buffanblu. The preseason No. 1 team collected 18 of 29 first-place votes to remain at the top in the Star-Bulletin Football Top 10 today. The Top 10 high school football teams as voted on by coaches and media from around the state. First-place votes in parentheses. Ten points for first-place votes, nine for second, eight for third, etc. Team, Record Last week This week PTS. PVS. » Also receiving votes: Waianae 34, Mililani 27, Kaimuki 13, Lahainaluna 6, Kalaheo 3, Kamehameha-Maui 2, Konawaena 2, Kauai 1, Pac-Five 1. » No longer in top 10 (previous rank): Waianae (No. 6), Mililani (No. 9). The Buffanblu will finally get on the field for a nonconference game this Saturday when Waianae visits Alexander Field. Kickoff is set for 2:30 p.m. and a big crowd is expected. Cayman Shutter will lead Punahou against Waianae on Saturday. » No. 1 Punahou: Received 18 of 29 first-place votes, will open season Saturday at home against Waianae. » No. 2 Leilehua: Received eight first-place votes after beating Radford 23-0, hosts No. 9 Iolani on Friday. » No. 3 Saint Louis: Received one first-place vote, opens season at Mililani on Saturday. » No. 4 Kamehameha: Beat Kahuku 35-0 and received one first-place vote, visits No. 5 Kapolei on Friday. » No. 6 Farrington: Beat Waianae 20-7 and received one first-place vote, visits Roosevelt on Friday. Leilehua, with a victory at Radford, remained at No. 2. The Mules, behind Andrew Manley's 372 passing yards, gathered eight first-place votes and widened the gap over third-ranked Saint Louis, which was idle. The Crusaders, with new coach John Hao, could show multiple looks in Saturday's season opener at Mililani. Hao was a run-and-shoot quarterback at Saint Louis and UH, but promises more than a few new wrinkles for a team loaded with talent at slotback and receiver. Farrington made the biggest jump in the poll, from 10th to No. 6. The Govs went to Waianae last weekend and won 20-7. Kapolei rose three spots to No. 5 following a 43-0 win at Kamehameha-Hawaii. Coach Darren Hernandez cautioned about the Hurricanes' prospects, but the wealth of individual talent certainly yielded high returns. Two-way performer Simione Vehikite ran for 90 yards and two scores on just four carries. Defensively, he had two sacks. Cyril Ontai, another versatile senior, ran for 102 yards on five carries and deflected two pass attempts. Chad Lopati, who's had a ferocious preseason, added three sacks and Luke Spencer had two more. Cornerback Kalani Brackenridge picked a pass and deflected three others. The 'Canes get a big test on Friday when they host No. 4 Kamehameha. Iolani and Castle joined the Top 10 this week. Iolani blanked Kamehameha-Maui, while the Knights upset then-No. 9 Mililani. Iolani, the defending Division II state champion, has a tough early-semester exam on Friday at Leilehua, last year's D-I state champ. Leilehua's defense, manicured by coordinator Mark Kurisu, has been a cornerstone for several years. The Mules relied on defense last season until injuries at quarterback required a callup of JV passer Manley. This year's Mule defense already has a shutout, but Iolani brings a no-huddle offense led by quarterback Kela Marciel. Waipahu's trip to Keaau was successful, to say the least. Troy Matautia ran for 152 yards and three touchdowns as the Marauders won 38-7. The Marauders rushed for 349 yards against a team that almost won the BIIF last season. Waipahu hosts Pac-Five on Saturday - the same team that downed Waialua 50-7 over the weekend. California power Edison (Huntington Beach) will play Lahainaluna on Saturday at War Memorial Stadium. Edison is currently ranked 19th in the West Region. Konawaena is the small country school and Kealakehe is the mammoth town school in Kona. But the Wildcats' Kawika Karratti hit a 35-yard field goal with 15 seconds left for a 9-7 upset.